Divorce can be a complicated, expensive and time-consuming process, especially when couples don't get along. However, even couples who don't get along can sometimes reach an agreement on the terms of their divorce with the help of a mediator. Mediation has many advantages, but it's not the perfect fix for every divorce situation. Mediation is a structured conversation or meeting in which a neutral third party -- the mediator -- meets with the divorcing couple. 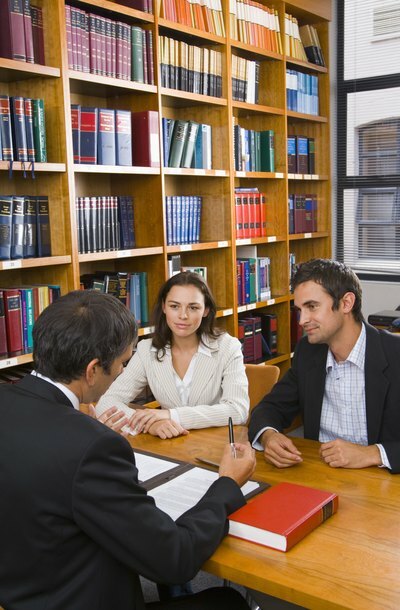 The goal of mediation is to reach an agreement on the terms of the divorce. The mediator guides the parties through constructive discussion and negotiation to achieve this. If they reach an agreement, they can sign a mediation agreement describing the terms to which they agree. The mediator is not a judge or arbitrator, and he does not issue a decision for the parties. Instead, he helps them create their own agreement, although each party's lawyer can participate in the mediation sessions as well. Requirements for mediators vary by state, with some states have no requirements at all. Not every mediator is a lawyer, and not every mediator understands the complicated issues involved in divorce. However, mediator lawyers, who have both legal knowledge and the communication abilities of a mediator, are available in some states. Generally, parties should investigate their mediator's background and experience level to ensure that he has the level of knowledge they expect and need. A lawyer's primary purpose is to represent his client. As an advocate, he is not focused primarily on reaching an agreement with the other spouse, but on getting the best deal he can get for the spouse he represents. This can make it more difficult for couples to reach agreement, because lawyers tend to establish a more adversarial approach to divorce. For example, spouses who are represented by lawyers tend to speak through them to get the best possible results, even if this means a little browbeating and some heated discussion. However, these tactics can sometimes make the other party resistant to reaching a resolution. If parties are successful in reaching an agreement in mediation, their divorce will typically conclude much more quickly and with less expense. A successful mediation avoids the legal fees and other costs associated with a drawn-out legal battle. Additionally, mediation allows the parties to retain control over their divorce terms, rather than relying on a judge to render a decision. However, mediation is a voluntary process and either party can walk away from it at any time. Thus, if one party decides to quit mediation, the mediation fees become an additional expense that the divorcing couple will have to address. Mediation.com: What Is Divorce Mediation? When Washington spouses divorce, they can agree on the terms of their divorce, and the court can adopt that agreement in the divorce decree. Washington law and the Washington court system encourage spouses to attend mediation, which involves a neutral third party who helps the spouses resolve their differences regarding child custody, spousal support or other issues so that they can reach agreement.